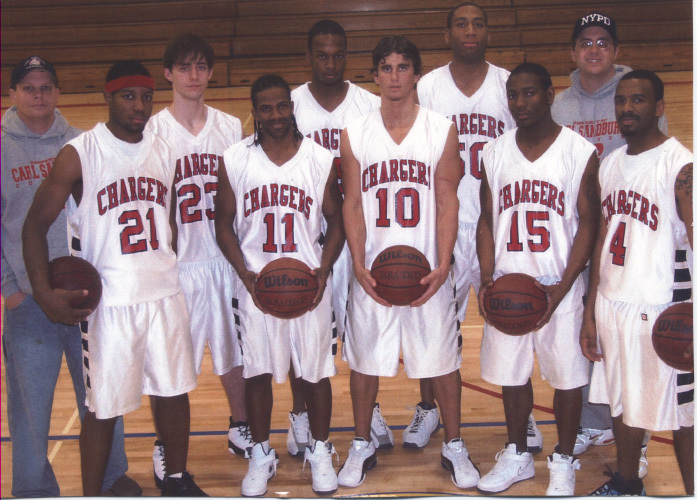 Front Row (L to R): Travis Nesby, Wes McGruder, Clint Cowman, Jason Jones & Corey Neely. Second Row (L to R): Assistant Coach Matt Hillhouse, Matt Barton, LaNerrick Harris, Brandis Leverette & Head Coach Mike Bailey. 4 Corey Neely 5' 10" G Soph. Flint, Mich.
5 LaNerrick Harris 6' 4" F Fresh. Flint, Mich.
10 Clint Cowman 6' 1" G Soph. Maquon, Ill.
11 Wes McGruder 5' 10" G Soph. Galesburg, Ill.
15 Jason Jones 6' G Fresh. Chicago, Ill.
21 Travis Nesby 6' 3" W Soph. Flint, Mich.
23 Matt Barton 6' 3" W Soph. Herrin, Ill.
50 Brandis Leverette 6' 3" P Fresh. Flint, Mich.